Did you know that before Uranus was Uranus, it was named George? 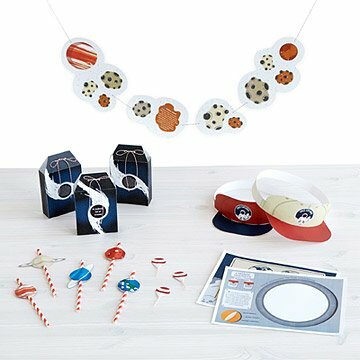 Learn this and a galaxy of other out-of-this-world facts with this outer space-themed party kit. Made for fans of the final frontier, each free downloadable kit comes with decorations and fun activities to make your gathering as memorable as the moon landing. The kid includes space shuttle and parachute cake toppers, planet straw toppers, and asteroid bunting. Guests can draw their own galaxy placemats, pin the North Star, and pose with moon landing photo booth props—all while wearing space explorer party hats. Make sure they sign the moon plaque guest book and pick up their black hole treat back before they leave! Each part of the kit provides simple yet detailed directions for cutting out and crafting decorations, games, and special details that'll bring extraterrestrial excellence to your gathering. For budding astronauts ages 5 to 105. Click here for your free download of the Printable Outer Space Party Kit. PDFs formatted for 8.5" x 11" paper. Includes 4 unique designs and 12 tags per sheet.